I was hoping some time away from this book would make things a little more clear, but alas, I am still as confused as I was when I finished. The thing is, there's not a whole lot to be confused about. It's a pretty straight forward story without a whole lot of twists or turns or lessons thrown in along the way. There are three main characters, and unfortunately three perspectives we get bounced between. (A plot device that's starting to get a little stale) Poppy is the snotty, entitled, do as I want screw the consequences "mean" girl, who is seemingly leading the drama. Wink is the daughter of a psychic, free spirit, who seems to live in a world populated by fictional storylines. 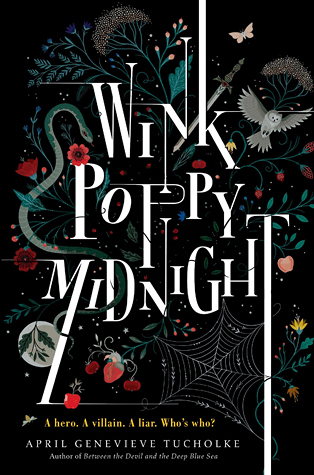 Midnight is the boy in-between, having caught the eye of Poppy but falling for Wink. Wink is dramatic and whimsical. She believes Midnight to be the hero in her story and Poppy the wolf, the villain, the creature needing slaying. But each of these characters is not what they seem. And that, I think, is the whole point of this book. That people are complex and flawed and not one thing in particular. The hero can also be the villain. The mean girl the saint. The weak girl the wolf. And while an author shouldn't have to come right out and tell the reader what the book is about, they can often just leave the reader wondering what they point was. No one changed. No one grew. No revelation was worth the switching back and forth between so many characters. Another book that was not necessarily poorly written, but not as well executed as I had hoped it might be in the end. Wink Poppy Midnight was all over social media too. Maybe I got caught up in the "hype". Hopefully you'll read it and we can chat. Maybe that's what this book needs. A really good discussion with a reading buddy. Want to be my reading buddy?